Dr. Cliff Kuhn has modeled his psychiatric practice and his therapeutic mission around the use of humor to overcome stress and fear, survive grief and setbacks, heal the body and mind, and achieve something increasingly elusive today: being happy! This book is a guide and sourcebook for everyone feeling beset by the difficult circumstances of everyday work and family life. It is the book version of Dr. Kuhn's successful humor seminars, in which thousands of people have rediscovered their "humor nature" and found a better -- and happier -- way to face the world. 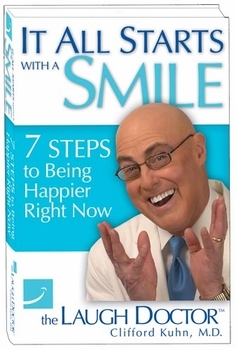 Through practical advice strengthened by plenty of funny and compelling anecdotes, It All Starts With A Smile can quickly and easily help readers reenergize their perspective and get back to feeling happy. Clifford Kuhn, M.D., is a professor of psychiatry at the University of Louisville School of Medicine. His medical practice has given him a deep appreciation for humor's healing power and, as a professional speaker and stage performer, he enjoys a unique perspective on the practical applications of humor. Through his company, Laugh Doctor Enterprises, Dr. Kuhn teaches techniques and strategies to individuals and groups who want to create an atmosphere of fun for enhanced personal performance, productivity and health.